As far as the human race can tell, we humans seem to live on the only planet with any form of intelligent life on it. Since the late 1960s mankind has been to or sent probes and telescopes outside the Earth to find out more about the Universe. Science fiction has given extraterrestrial life a quirky and eccentric image that can be hard to comprehend or simply dismissed by a vast majority. But hold on! Rumours of Area 51 aside, we have never seen an Alien. Haven't heard anything nor have we received any messages or concrete proof that there is alien life out there. Many scientists believe that due to the vast size of the universe, life most likely has evolved somewhere else aswell. 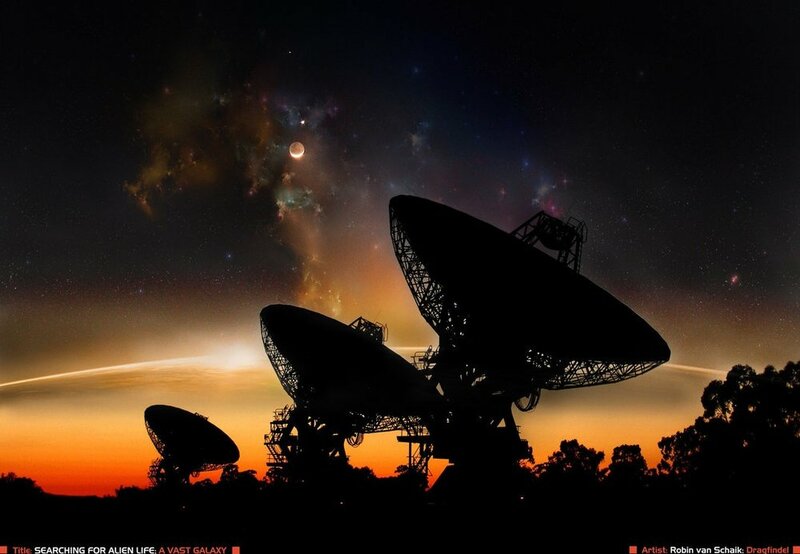 The issue is, how do we calculate how many aliens we should see, if we haven't seen any? Our own Milky Way galaxy has 200 billion stars. Recent analysis of planets orbiting these stars, without totally guessing, shows that at least one planet per star seems to be habitable. So 200 billion planets within our own galaxy have been deemed "similar" to the Earth. Habitable in this sense that the planet isn't too close to the star it orbits and the surface temperature of the planet is similar to ours. If a star has the same mass and energy output as our own sun and the planet seems to be a similar mass to Earth, the odds of liquid water surviving on the planet are statistically quite high. In physics the mathematical probability of alien life is a massive subject and when looking at the facts, the odds are extremely high. Dr Frank Drake's famous Drake Equation shows the odds to be high also, however the word "probability" confines this to a complete guess. As Earth is the only completely verifiable habitable planet, our scientific sample size is just 1. There are many scientific arguments both for and against the question "should aliens exist"? On the pro-alien life side, there are 200 billion potentially habitable planets inside our own galaxy. There are billions of other galaxies in our universe. So the number of potentially habitable planets could be around the many trillions mark! The odds of life sprouting on just another 1 of these planets is reasonable to predict. Carl Sagan didn't strongly held this viewpoint with time being on their side. Our species is only 200,000 years old and we have walked on the moon and sent probes like Voyager out of the solar system. We have many probes and space stations in our own solar system and beyond which are designed to tell other life things about us should they be intercepted. The Voyager probe actually has a disc on the side with picture instructions on how to play it should it be found by another civilisation. So let's use that in reverse, we haven't seen any of their stuff or their space stations assuming they have the technology to leave their own planet. This is called the Fermi Paradox which places alien life existing, because we haven't seen it, as astronomically low. Depending on which side of the fence you sit on, the argument is equally as compelling on both sides. It is important to note than in our vast universe; the Earth, the Sun and our own solar system aren't special. So our non special planet has sent probes into space within our 200,000 year existence and left a trace. We haven't seen a trace from anyone or anywhere else but the odds of Life outside the Earth in the entire solar system are also astronomically high and can't be ignored.